The new route will join Kitsap Transit's Bremerton Fast Ferry, which launched service last year, after Kitsap County voters narrowly approved a 0.3 percent sales tax to fund the new fleet of passenger ferries. UPDATE: Kitsap County commuters have a new — fast — way to get to downtown Seattle. The Kingston Fast Ferry, a passengers-only boat capable of making the Kingston-to-Seattle trip in 39 minutes, started regular service on Monday. 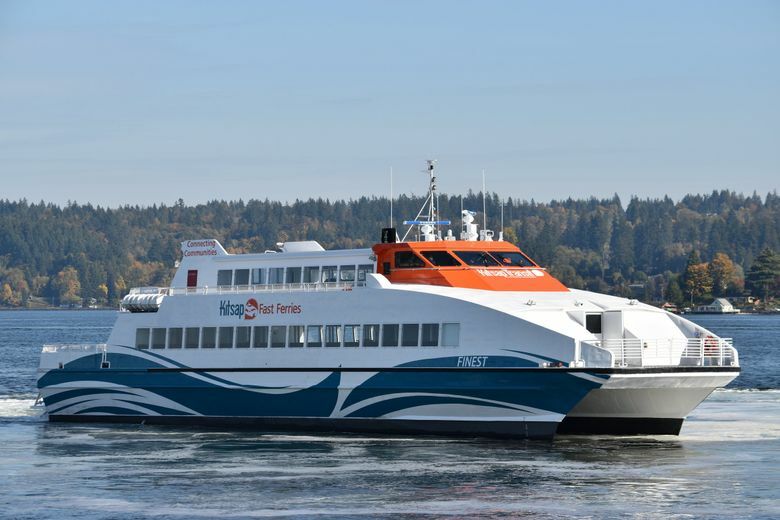 The new route will join Kitsap Transit’s Bremerton Fast Ferry, which launched service last year, after Kitsap County voters narrowly approved a 0.3 percent sales tax to fund the new fleet of passenger ferries. That route has a long history of passenger-ferry service, but it had been absent for about a decade. The agency plans to launch a Southworth route in 2020. The Kingston ferry will make six weekday round-trip sailings — three in the morning and three in the afternoon — between the Kingston Ferry Terminal and Colman Dock in downtown Seattle. The first sailing of the day will leave Kingston at 5:25 a.m., while the last will leave Seattle at 6:45 p.m.
Saturday service will begin in May, Sanjay Bhatt, a Kitsap Transit spokesman, said. The agency will also launch two express-bus routes from Kitsap County park-and-ride lots to the Kingston Ferry Terminal. The 39-minute trip should speed the commutes of many Kingston-area residents. Currently, the options for getting to downtown Seattle from the northern Kitsap Peninsula are two Washington State Ferries routes: Kingston to Edmonds or Bainbridge Island to Seattle. Both routes take about 30 to 35 minutes. But the Edmonds route requires a bus or car ride to Seattle, and the Bainbridge route requires driving to the Bainbridge Island Ferry Terminal, both of which can take an additional 45 minutes. 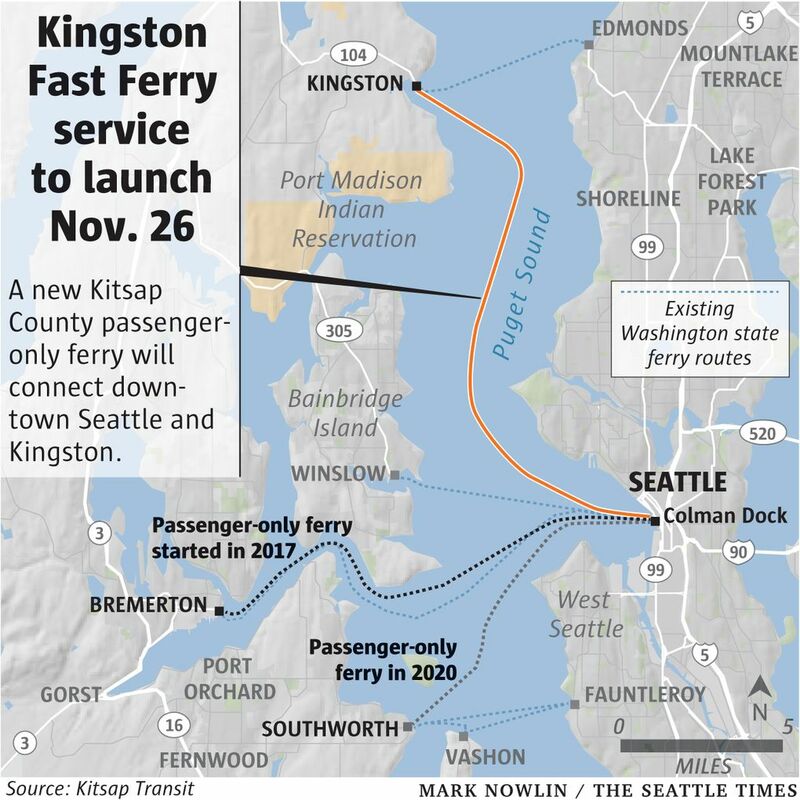 The new Kingston route will cost the same as the Bremerton Fast Ferry — $2 to Seattle and $10 for the return trip. A passenger fare on the similar Washington State Ferries routes costs $8.50 going west, with the return trip free. The route will be served by Finest, a used ferry that previously operated between Manhattan and New Jersey and was named after the New York City Police Department. Kitsap Transit bought the boat for $1.5 million, but shipping and refurbishment costs have raised the total cost to $7.8 million. It has a top speed of about 40 miles per hour. The agency is paying about $29,000 a month to lease a backup ferry for the route, the Melissa Ann. With a capacity of 350 passengers, Finest is more than twice the size of the fast ferries serving Bremerton. Because of the larger capacity, Kitsap Transit won’t be using a reservation system, as it does for the Bremerton route. The Bremerton route was initially plagued with mechanical problems, but completed 100 percent of its scheduled sailings in September, with 90 percent on-time performance, according to the agency.